WFW friends, prepare to be wowed. Sandra Kring is honest and inspiring and humble — even after writing and publishing five novels. It’s my honor to share this interview with all of you. Amy: A LIFE OF BRIGHT IDEAS is your fifth novel! Can you share with us a little (or a lot) of your personal author history? We’d love to know how you started writing novels and — and how you’ve continued to come up with your own “bright ideas”. Sandra: I sold my first novel, Carry Me Home in ’03. I wrote the book in six weeks, found an agent two weeks after I started looking, and got my first contract from Random House two months after that. Sounds like a writer’s dream come true, right? Well, it was—eventually. But as you all know, over-night successes don’t happen overnight. I grew up in a violent home and had dumb and worthless literally pounded into my head by my mentally ill mother. I had no books growing up (but wanted them), barely got through high school, and married at seventeen and hurried to have babies. Growing up, I believed that all the good things in life were reserved for those more deserving than I, and I might never have picked up a book if my 18-year-old husband hadn’t been addicted to the news. He’d started college and couldn’t afford to buy newspapers, so we started hiking to the library every day so he could read them. I don’t know how many days I sat there staring into the silence before he mentioned that I was going to get awfully bored if I didn’t find something to read. So I got my first library card and started in the fiction section. In no time at all, I was reading 4-6 novels per week. Years later, with two of my children grown, and the third not all that far behind, I realized that my marriage was in trouble, and so was I. I’d been through years of therapy and had my PTSD under control, but my role as full-time mother and wife were coming to an end, and I felt old and worn and useless. Also, around this time, I was watching my depressed father suffer a slow death. He had eyes just like mine, and in them, I saw my future if I didn’t find a way to make the second half of my life more joyful than the first half of my life had been. But I had no idea how to turn things around. That is, until I came across a quote by psychologist James Hillman that turned my life around: To heal the person, we must first heal the story they imagine themselves to be in. So I looked at my life as if it were a novel, and I, the protagonist. And I asked myself, If I were the author, what could I make happen in this story to give it a satisfying ending? Suddenly, the answer became clear. The protagonist would take the best of what a bad beginning had taught her—tenacity, a sense of humor, an in-depth understanding of human nature, a knack for noticing detail, a curiosity about how stories will end—and she would apply these attributes to her love of fiction, and become a novelist! And through her writing, she would find her voice and be set free from the tragic script her mother had written for her. She would make a new role for herself, so that when her last child left home and her marriage ended, she’d have a means to support herself and a new, exciting beginning already underway. So that’s what I set out to do. But first, I had to learn how to write. I used novels as my textbooks, and identified the facets of writing I needed to learn. Then I worked on those things systematically, writing pages of dialogue, description, metaphors and similes, and 3-dimensional characters. Only when I felt I’d aptly learned the basics skills, did I attempt my first novel. My characters were rich, the writing mediocre, and the story itself, only slightly better than pitiful. But I was hooked! I went back to the drawing board for more practice, and some months later, woke at 5:00 a.m. armed with a single question—I wonder what it’s like to send a loved one off to war, and have them come back broken? All I knew when I sat down at my computer, was that the story would have a mother, a father, a hero son, and his sibling as the narrator. Five minutes later, the voice of Earwig appeared to answer my question. And one paragraph into the story, I thought, This is it—this is the book I’m going to sell! For me, learning to write was the easy part. The hard part was holding onto the belief that I could make my writing dream come true. I think that’s every writer’s challenge, no matter where we come from. For what aspiring writer wouldn’t be willing to work as hard and long as she needed to, if only she knew for certain that in the end she’d get published? But there are no guarantees in this business. In my case, ignorance was bliss. I had no idea that the stats that said it was far more likely I’d fail, than succeed. I simply decided that getting published couldn’t really be any different than setting a grueling goal like walking across the country from the east coast to the west. Without a map to guide me, I might zigzag, walk in circles, or need to pause and rest at times, but if I kept my putting one foot in front of the other, I’d eventually have to reach my destination, wouldn’t I? Amy: A LIFE OF BRIGHT IDEAS is a sequel to THE BOOK OF BRIGHT IDEAS. Did you know while you were writing the first book that the story wouldn’t really before with The End? Sandra: I knew that ending The Book of Bright Ideas with little Button and Winnalee being separated would sadden readers, yet there was no other way to end the story—it’s what would have happened. But at the same time, I didn’t want readers to feel worse when they closed the book, than they did before they opened it. So I let the story end with Button’s hope that she’d find Winnalee one day. Amy: What about the characters made you want to get to know them in their future — and in yours? Sandra: I knew that if I wrote a sequel, Button and Winnalee would be older. Mainly, because I’d said all I had to say about them at the tender age of nine. Yet in growing them up, I faced a challenge: How to mature these characters, yet keep the essence of who they were as children intact. Making them eighteen seemed like the perfect option, since at eighteen we’re still wobbling between childhood and womanhood. As for why I finally chose to write the sequel, the answer is simple. Five years after the release of The Book of Bright Ideas, readers were still writing to ask me, Where did Freeda and Winnalee go? Did Freeda ever straighten her life out? Did the girls ever reunite? I found it endearing that they asked as though Button, Winnalee, Aunt Verdella and the others were living, breathing relatives or friends of mine, rather than fictitious characters crafted for the purpose of telling a story. Eventually, I decided it was time to fulfill my readers’ wishes for a sequel. And I’m really glad I did, because I had a blast revisiting these characters. Amy: Obviously, with five novels notched into your desk, you have found a way of writing that works for you, your publisher(s) and your readers. Do you outline and plan or sit down and see where the wind takes your story? Sandra: When I sat down to write Carry Me Home, the opening poured out, and with it, a clear image of the final scene—even the last line. But I had no idea what would happen in between. I thought I’d always write with the same freedom, but after getting my editor’s comment back on my sophomore novel, I realized that my free-writing method hadn’t worked out as well the second time around. With Carry Me Home, history itself dictated my plot, and all I needed to do was to have my characters react to those events. But I was on my own with The Book of Bright Ideas. My editor pointed out that all the events were crammed into the last two-thirds of the book. She suggested I create a graph and break the story into thirds, listing the events within each. In doing this, she claimed, I would not only see how sparse the events were in the first third, but I could more easily see how I might redistribute them. She was right. Through trial and error, I have learned that if I dive into a book with no idea of where the story is going, I end up with a bunch of characters meandering around the first few chapters like actors waiting for a script. Yet on the other hand, if I construct a rigid outline, I end up feeling like I’m writing out thank-you notes, using a prearranged message. So I had to find a happy medium. Today, I write out a vague synopsis that includes the key events, and then let spontaneity fill in the spaces between them. Now my characters can move with purpose from the first page onward, yet they have enough wiggle room to create the surprises I seem to need in order to keep the writing process fun. Amy: What have you learned about readers of women’s fiction over the course of your career? We know publishing has changed. Have readers? Sandra: I don’t think readers of women’s fiction have changed (they still want characters they can relate to and care about, and engaging plots. They still want to be prompted to think, and more so to feel), but I do believe that their buying habits have altered. Not only are readers busier than ever, but they also have less money than they had before. So they pick and choose what they’ll give their time and money to more carefully. And with an ever-growing array of books to choose from via e-readers (many books free, or at far lower costs than paper books), they have more reading options than ever. With so many options, and less time to browse book stores, many readers seem to be doing what publishers themselves are doing—giving their attention to the blockbusting novels. Amy: How do you define women’s fiction? Sandra: I define women’s fiction as stories that deal mostly with themes that are exclusive to being female. You know, the topics that, when you bring them up to men, cause their eyes to glaze over. Amy: As someone about to embark on the whole “published author” experience, I have to ask: what is your best advice for debut authors of women’s fiction in today’s publishing and reading climate? Also, what’s your best advice for aspiring authors of women’s fiction? Sandra: Whether you’re an aspiring writer, a debut author, or a seasoned novelist, the publishing end of a writer’s life is stressful. If you’re an aspiring author, you worry about creating a story and query that will wow prospective agents. If you’re a debut novelist, you agonize over how best to promote your book, and you worry that no one past family and friends will buy it. And when you’re a seasoned writer, you fret over if you’ll be able to keep your stories new enough, yet familiar enough to appease your readers, your agent, your editor, and your publisher. Yet at any stage of the writer’s journey, you must learn how to keep these anxieties from crawling onto your lap when you sit down to write. That is, if you want to keep your sanity intact and your creativity flowing. If you don’t, you’ll be observing everything you write through the eyes of would-be readers, and putting a choke-hold on your writer’s voice. How long, then, before writing feels like a daunting chore? So deal with your anxieties the best you can during your non-writing hours. If you’re an aspiring author, work on your writing skills until you master them, and research how to write an irresistible query. If you’re a debut author, rely on seasoned authors to tell you what marketing methods worked best for them, and which ones they believe were time-wasters. If you’re a seasoned writer, listen closely to your fans so you’ll know what elements of your writing appealed to them, and find creative ways to deliver them more of what they want, but in stories that are fresh and exciting. But when you sit down to write, forget about everything but your story. See it, breathe it, believe it, and love the story you’re in, so that readers will do the same. Yes, the choices we make on the publishing end matter, but when all is said and done, it’s the stories themselves that will matter most. One January morning, after a string of miserable circumstances that had me convinced that I was a fool to believe that anything good could ever happen to me, much less my biggest dream, I woke to a blizzard raging outside. Unable to face the day, I told my husband and son to eat left-overs, and crawled back into bed with a bag of Oreo cookies, a jug of diet soda, a pack of cigarettes, and a stack of library books. I chose to start with Tawni O’Dell’s debut novel, Back Roads, for one reason, and one reason only—I thought reading a bleaker story than the one I was living might remind me that things could be worse. Imagine how surreal it would have been, had someone stepped into my room on that hopeless Sunday back in 2000 and told me that in two years’ time, the very author whose book I was holding in my hands would be blurbing my first novel. I hope you’ll remember this story on your stormiest days. My thanks to WFW for including me on your wonderful blog. I wish you all a productive and fun writing day. May you all write a successful publishing story for yourselves. Sandra Kring lives in central Wisconsin. Her debut novel, Carry Me Home, was a Book Sense Notable Pick and a 2005 Midwest Booksellers Choice Award nominee. 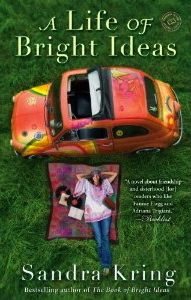 The Book of Bright Ideas was Target’s Bookmarked pick for the summer of ’06, and named to the New York Public Library’s Books for the Teen Age list as a cross-over book in 2007. Thank You for All Things was All You magazine’s first book club selection. How High the Moon, was a Midwest Booksellers Association’s Connections Pick, and a Target Breakout Book. Kring’s latest book, A Life of Bright Ideas, was released this past February and featured in Target’s Emerging Author’s section. Oh Sandra, what an inspiring story! Congratulations on your success, and I wish you much more. After what you’ve been through, you deserve every bit of it! Soldier on, Lady! 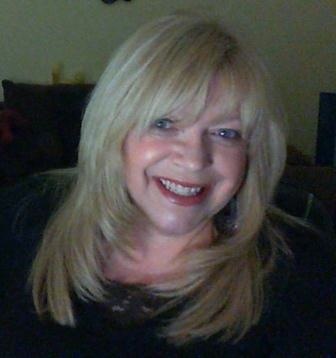 Laura – Any aspiring author who wants the published author’s life to the point that it makes them ache, and is willing to work hard to get there, deserves it. I get mail from many aspiring authors, and most often, what they want is for me to look at their work and tell them if they are talented enough to “make it.” And I swear, in most cases I don’t need to look at their work to make a reasonable guess—I’d put my money on the ones who want it the most, every time. Thanks for the comment, Laura. May we all soldier on! Amy and Sandra, thank you so much for being there today. This was the first thing I read this morning after the morning news, and I really needed to read it so that I’d have the guts to put on my shoes, march myself out to my office, and tinker away on my new novel. I want to echo Laura’s comment here. You deserve every success, Sandra. You’re an incredible writer and an amazing inspiration to the rest of us. Holly – Show me an aspiring author who needs to “get the guts” to face her story in the morning, and I’ll show you someone who is judging her story too harshly. Writing the first few chapters of a new book will always feel awkward (until you know your characters well, and the story takes on a life of its own), and first drafts will always be sloppy (and should be allowed to be, because that’s where the unique ideas sprout, even if later you’ll need to weed around them). And later drafts will always bring you to the point where you’re no longer sure if you’re helping the sentences or hurting them (in which case, you’re either done, or you need more information on the editing process). Stay disciplined, Holly, but mostly stay inspired. Renew your enthusiasm often with the stories of authors’ early days (as you did this morning), and devote some time every day to daydreaming about what your life will be like once you get published. My best to you, Holly. May you have a fun and productive writing day! Wow!! What a great interview! So inspirational and encouraging – just what I needed to read today. Thank you, Sandra, and can’t wait to read you! Years ago, when I doing more thinking about getting published, than working toward it, I wrote a fan letter to Jennifer Lauck, the author of the memoir, BLACKBIRD. I’d never written a fan letter before, and this was still before the net was offered in the rural village where I lived, so I sent the letter to her publisher. Six months later, on one of my you’ve-got-to-be-kidding-you-think-you-can-really-do-this-days, I heard back from her. Jennifer’s letter had been written on an old manual typewriter that she loved, and she corrected her typos with XXXXXs. She wrote a few nice, encouraging words, but that isn’t what gave me the confidence that maybe I COULD become published. It was that she allowed those strike-outs to remain. That after a couple of paragraphs, she said she had to go because her husband wanted dinner, and her 6-year-old was running in circles around the table and making it hard for her to concentrate. In seeing that she was just a “regular person” like me, I found my confidence. I think that’s the value of WFW. You get to see that all published authors are just like you. Ordinary people, who made an extraordinary dream come true by working hard. My best to you. Stay inspired! Hi Sandra, thank you so much for your words of wisdom. Whenever I read a post like yours or have the chance to communicate with published writers I remain encouraged. For me as well, it is comforting to learn that most authors are ordinary people who have made an extraordinary dream come true by working very hard. So I will keep writing! I look forward to reading your latest work! Amy, as always, thank you so much! I enjoy reading WFW every week! Sandra, thank you! And Amy, you are so brilliant to bring these wonderful role models to your blog! Thank you. Sandra’s story is so encouraging, and I can’t wait to read A LIFE OF BRIGHT IDEAS. But first, I’m going to grab my own pen and start scribbling! Rebbie – I hope you’re scribbling away, inspired as can be! And if you ever do get around to reading A Life of Bright Ideas, I hope you love it! Happy writing! Congratulations on your success, Sandra. What an inspiration you are! Lori — Thanks! And just think, one day you’ll have an inspiring story of your own to pass along to aspiring authors! Because really, we all have a story. Sandra, you have given such a gift to so many of us who write and who face the challenges of sticking with it on the days it doesn’t flow like sap but instead clogs the hole like dried glue. Thank you for such an honest account of not only your writing life, but your personal life too (even though I know some days we wonder if there is a difference 🙂 )–You and Amy have made my morning writing even richer today with so much to think about. Erika – I don’t know how I missed your post earlier today (maybe you were posting at the same time I was), but I’m glad I spotted it tonight. Ah, inspiration! I’ve given a lot of attention to staying enthused in this guest blog, because it’s vital if you’re going to keep working until you get where you want to be—published. But your comment, gives me the perfect opportunity to flip the coin over and talk about the other element that a writer needs—discipline! I’m a person who notices patterns. And early on in my writing endeavor, I noticed something that surprised me: That the amount of words, and the quality of those words, couldn’t be predicted by how much enthusiasm I felt, or didn’t feel, when I sat down to write. So I stopped waiting for the mood to strike me, and I started working harder on being disciplined. I picked the time of day that most often gave me the most favorable results (early morning, even though I’m more of a night owl—probably because I had less distractions), and I set the amount of time I’d write each day at a minimum of 4-6 hours. I still follow that rule today, at least when I’m beginning a new book, and am still in that stage where the story feels awkward, and I’m still trying to learn who my characters are, but even once the story takes on a life of its own, I still have to use discipline. Not to keep myself writing, but to keep myself from writing too long. I learned over time, that if I push myself beyond when the words stop flowing, I’m usually tossing out everything I wrote beyond that point. So my rule of thumb is, once the flow is over and the words start really slowing, it’s time to quit. But when I’m on fire? I’ll write for 14-16 hours straight, then, and turn out a good twenty-two pages. I don’t get overly excited when that happens, though, because my writer’s mind is usually sluggish the next day; it all evens out. Anyway, thanks for leaving a comment, Erika. May you stay inspired, and disciplined! Sandra, discipline is SUCH an important component in our writing, isn’t it? I try to be the very same way–we all joke about the muse, but at the end of the day, whether she’s there or not, you need (and can!) put words to paper regularly. And as you said, some days the story flows better than others, but even on those days it is a struggle I return to that WIP consistently. But certainly, when the fire is raging, we write even more and it feels good to see those flames through. Thanks, Sandra, for sharing. It’s the stories of real people–and authors–that keep me going. Zan — That’s one of the perks of being an aspiring author today. You have the net and easy access to published writers and their stories. You get to see that they are real, that they too struggled to make their writing dream come true. I’m glad WFW gave me the opportunity to share my story with you all. Have a wonderful writing day, Zan! What a FABULOUS post. Wow, Sandra, your story of overcoming tragedy to rewrite your future is so uplifting and inspiring. And no truer words have ever been said: “The hard part was holding onto the belief that I could make my writing dream come true.” Armed with your Tawni O’Dell story, I feel more optimistic today, knowing – of course – I must continue to put in the hard work and time. I also have found a similar structure for plotting/planning. I agree that rigid outlines feel like prearranged thank you note messages (how I wrote my first WIP and how I’m NOT writing my current one). And, finally, I think your advice is worthy of printing and putting up next to my monitor: “Forget about everything but your story. See it, breathe it, believe it, and love the story you’re in, so that readers will do the same it’s the stories themselves that will matter most.” Yes, indeed, the stories matter most. Your novels sound wonderful; going to check them out on Goodreads/Amazon right now! Thanks for a heartfelt post (and a great interview, Amy). Melissa — I’m honored that something I said will grace your writing space! I used that quote like a mantra, because I knew that in order to write stories that emotionally engaged readers, I needed to learn how to spill my guts on paper. That was an intimidating thought for someone like me, who had learned to mask feelings and keep my opinions to myself. All this to say, that I believe in the power of inspirational words to get us writing and keep us writing. Thanks so much for your comment, Melissa. My best to you. Thank you so much for sharing the quote – and for having the courage to get that emotion down on paper! The key is, indeed (at least for my reading and writing preferences) to “emotionally engage the reader.” I want to BE in a story with the characters! This is a wonderful interview. I’m always in awe of people who find a way to go beyond rough beginnings, People who find within themselves the passion to go forward to their truth. Now I have to read her books. Sari — Overcoming adverse situations is the root that from which all good stories sprout. Not only the ones we write, but the ones we live. I’m glad you found my life story inspiring, and I hope you find my books the same. Karen – On the day I learned I’d sold my first book, one second I was sitting in my office chair, sweating in front of the fan and wondering if there were any towels clean because I was going to a movie with a friend and needed to shower, and a second later, my agent was on the phone saying, “Your new editor at Random House is calling you. Right now! Hang up!” And that’s the way it happens. On a dime. Seemingly out of nowhere. One moment you’re an aspiring author, filled with hopes and doubts and trying to justify to yourself and others why you spend countless hours holed up in your writing space, and the next moment, you’re there! I’ve personally known some very talented writers who gave up, and it always pains me when that happens. Writing is an odd process in that you don’t really see yourself getting closer and closer to your goal (unfortunately), you simply are unpublished one day, and the next, you’ve arrived! None of us really knows when that day will come, but we have to believe it’s coming. Keep writing, Karen. No matter what, keep writing until it happens! Wow! What an amazing, inspiring interview. The Jame Hillman quote had me tearing up. Thank you for the great advice. As a debut novelist, I’m working on keeping those anxieties off my lap. Lorrie – Thanks so much. And yes, isn’t that quote terrific? Being a lover of the written word (as all we writers are), I think it’s so magical when exactly what we need to hear, comes to us via the written word. I found those words in some obscure little book he’d written for professional Jungian psychologists (which I am not). I didn’t understand half of what he said, but I sure understood that! Very poignant, candid and inspiring interview. I will definitely keep it in mind when I have one of those ‘can’t face the day’ moments. Thank you for sharing your story so openly and I had to laugh when you say that ‘ignorance is bliss’. You know I’m going to…! I am so excited to see this inspirational interview because a few weeks ago I won A LIFE OF BRIGHT IDEAS from Amy’s giveaway! I was excited when I won it, and now I’m even more excited after reading this interview. I just started to query a women’s fiction novel and have started on a brand new WIP, so I really needed to hear this: “…When you sit down to write, forget about everything but your story.” I am writing that on a post it and sticking it to my computer! Thank you so much! Julia ~ I’m glad you were happy to win a copy of my book, and that you got something out of the interview. My best to you as you begin the exciting, yet stress-producing journey of finding an agent. You did the work, now you’ll have to trust that wing and a prayer. Having a WIP going should at least help curb your nervousness during the query-go-round process. Sure, you’ll check your email box every hour, but in between checks, go back to your WIP and ask yourself the only question that should ever be present while we’re writing: What does my story need? Goodness. our childhoods could be laid over each other like transparencies. Those voices are still running around in my head. This was inspiring and a wonderful message. Thank you. I’m going to give the anxieties a kick. Well I can see I’m over a year late here, but WOW – I must not have started getting Amy’s e mail newsletters until after this as I’d already spoken with Sandra when this interview was done last year! Since Sandra’s first book, Carry Me Home, is one of my all-time favorites, I reached out to Sandra for some writing advice, received it ten-fold, and once I get my women’s fiction book published Sandra will be right at the top of people I thank.